In our daily word and study, we may encounter some special situations that we need to save PDF as image format, such as PNG, in order to read it on a portable device that comes with no PDF viewer application installed, or make it convenient to attach with PowerPoint Presentation. Do not know how to convert PDF to PNG images? Here in this article, we will show you an efficient way to achieve your goal. To export PDF to PNG, you need to find a professional PDF to PNG converter. 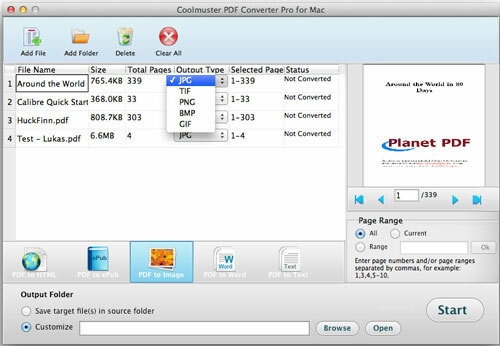 Instead of asking you to find a tool on the Internet by trial and error, we suggest you choose Coolmuster PDF Converter Pro (for Windows users) and PDF Converter Pro for Mac(for Mac users), which are such PDF tools to convert native PDF files to PNG image on Windows and Mac platforms without losing the good original quality. Just in 3 steps, you make it! 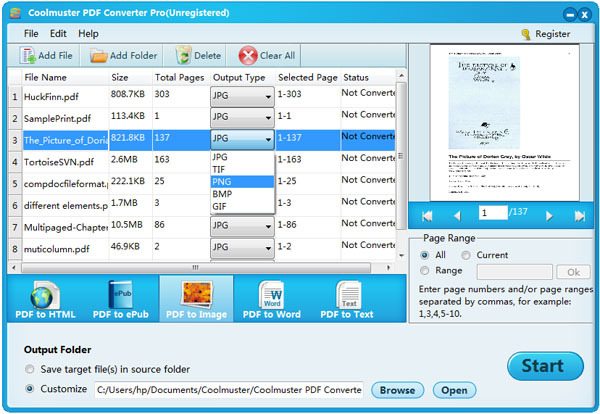 See how to use this PDF converting tool to convert PDF to PNG. 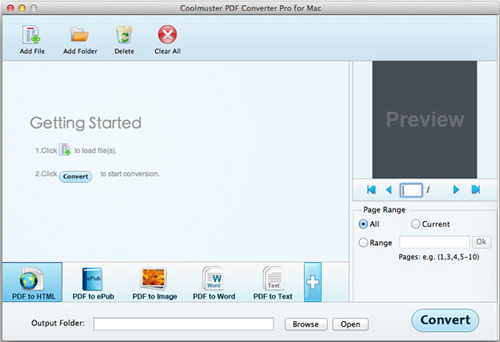 Below is the steps for converting PDF to PNG on Mac OS X with the help of Coolmuster PDF Converter Pro for Mac. Download the free trial version from below and follow the guide step by step. After downloading and installing the Mac PDF Converter on your computer, click the quick start icon on the desktop to launch it and you can either drag and drop PDF files to the software, or click "Add Files" or "Add Folder" to import PDF documents. Several PDF files can be loaded to the Mac tool at a time. Choose the conversion type as "PDF to Image" and choose "PNG" as the output format. You can also choose other image formats as the output format, including JPG/JPEG, BMP, TIFF, GIF, etc. Click "Browse" to choose an output folder for saving the converted images. Tip: You can set page numbers or page ranges of the PDF to convert specific pages to PNG images. Click "Start" button to launch the conversion. The conversion will be finished in a second. Then, you can go to the output folder to check the output PNG images. See? The quality of the PNG images is almost the same with the original PDF. Part 2. How to Convert PDF to PNG for Windows 8/7/XP? 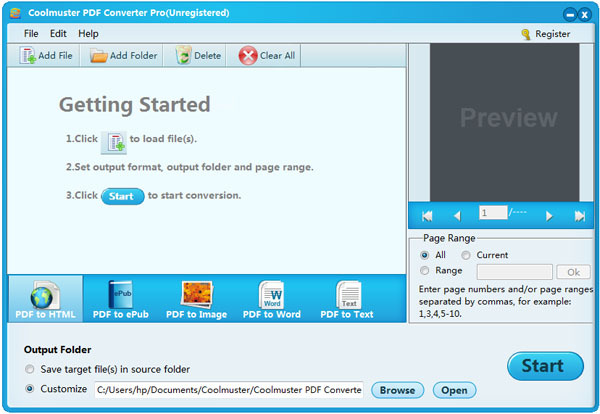 Launch PDF to PNG Converter on your PC, click "Add Files" or "Add Folder" to load the target PDF files to the program. Select the conversion type as "PDF to Image" and then choose .png as the output format. Then, specify an output location where you want to save the exported PNG images by clicking the "Browse" button. Finally, you can hit on the "Start" button save PDF files as PNG images in seconds. That's all about how to convert PDF documents to PNG images on Windows and Mac computers. By the way, Coolmuster PDF Converter Pro also enables you to convert PDF to Microsoft Word, HTML webpages, ePub, Text, etc. Download it to explore more!